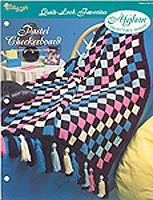 The Needlecraft Shop Crochet Collector Series: Pastel Checkerboard, designed by Joy Christina McNeese, The Needlecraft Shop, 1994. Subscription series pattern leaflet. Excellent condition, but may smell slightly of cigarette smoke. The Needlecraft Shop Afghan Collector Series: Patchwork Garden, designed by Vicki Watkins, Afghan Collectors' Series by The Needlecraft Shop, 1995. Subscription series pattern leaflet. Excellent condition. The Needlecraft Shop Afghan Collector Series: Patchwork Jewels, designed by Trudy Atteberry, Afghan Collectors' Series by The Needlecraft Shop, 1998. Excellent condition; may have slight smell of cigarette smoke. The Needlecraft Shop Afghan Collector Series: Patchwork Quilt, designed by Susie Spier Maxfield, Afghan Collectors' Series by The Needlecraft Shop, 1995. Excellent condition; may have slight smell of cigarette smoke. The Needlecraft Shop Afghan Collector Series: Patchy Eye Catcher, designed by Aline Suplinskas, Afghan Collectors' Series by The Needlecraft Shop, 1999. One-page pattern leaflet. New. The Needlecraft Shop Afghan Collector Series: Picot Shells, designed by Erma Fielder, Afghan Collectors' Series by The Needlecraft Shop, 1993. One-page pattern leaflet. Very good condition. The Needlecraft Shop Afghan Collector Series: Pink Frosting, designed by Roberta Maier, Afghan Collectors' Series by The Needlecraft Shop, 1995. Very good condition; slight smell of cigarette smoke. The Needlecraft Shop Afghan Collector Series: Playful Colors, designed by Sue Childress, Afghan Collectors' Series by The Needlecraft Shop, 1996. Very good condition; may smell slightly of cigarette smoke. The Needlecraft Shop Afghan Collector Series: Popcorn Clusters, designed by Maggie Weldon, Afghan Collectors' Series by The Needlecraft Shop, 1999. Very good condition; slight smell of cigarette smoke. The Needlecraft Shop Afghan Collector Series: Pretty Parasols, designed by Letterese Carr, Afghan Collectors' Series by The Needlecraft Shop, 1993. Very good condition; may have slight smell of cigarette smoke. The Needlecraft Shop Afghan Collector Series: Pretty Posies, designed by Darla J. Fanton, Afghan Collectors' Series by The Needlecraft Shop, 1996. One-page pattern leaflet. Very good condition. May smell faintly of cigarette smoke. The Needlecraft Shop Afghan Collector Series: Primarily Squares, designed by Carol Smith, Afghan Collectors' Series by The Needlecraft Shop, 1998. One-page pattern leaflet. New. The Needlecraft Shop Afghan Collector Series: Promenade Rose, designed by Sandra Miller Maxfield, Afghan Collectors' Series by The Needlecraft Shop, 1995. Very good condition; may have slight smell of cigarette smoke. The Needlecraft Shop Afghan Collector Series: Puffs & Fans, designed by Joyce Messenger, Afghan Collectors' Series by The Needlecraft Shop, 1995. Very good condition; may have slight smell of cigarette smoke. The Needlecraft Shop Afghan Collector Series: Pulsating Purple, designed by Susie Spier Maxfield, Afghan Collectors' Series by The Needlecraft Shop, 1998. Very good condition; may have slight smell of cigarette smoke. The Needlecraft Shop Afghan Collector Series: Quick & Cozy, designed by Darla Fanton, Afghan Collectors' Series by The Needlecraft Shop, 1998. Very good condition; slight smell of cigarette smoke. The Needlecraft Shop Afghan Collector Series: Quilted Lattice, designed by Sandra Miller Maxfield, Afghan Collectors' Series by The Needlecraft Shop, 1995. Very good condition; slight smell of cigarette smoke. The Needlecraft Shop Afghan Collector Series: Radiant Ripples, designed by Katherine Eng, Afghan Collectors' Series by The Needlecraft Shop, 1994. One-page pattern leaflet. Very good condition. The Needlecraft Shop Afghan Collector Series: Raspberry Creme, designed by Daisy Watson, Afghan Collectors' Series by The Needlecraft Shop, 1995. Very good condition. The Needlecraft Shop Afghan Collector Series: Rings of Fire, designed by Roberta Maier, Afghan Collectors' Series by The Needlecraft Shop, 1994. One-page pattern leaflet. Very good condition. The Needlecraft Shop Afghan Collector Series: Rustic Simplicity, designed by Darla Fanton, Afghan Collectors' Series by The Needlecraft Shop, 1995. Very good condition; may have slight smell of cigarette smoke. The Needlecraft Shop Afghan Collector Series: Sampler Stripes, designed by Roberta Maier, Afghan Collectors' Series by The Needlecraft Shop, 1993. Very good condition; may have slight smell of cigarette smoke. The Needlecraft Shop Afghan Collector Series: Scallops & Chains, designed by Trudy Atteberry, Afghan Collectors' Series by The Needlecraft Shop, 1996. Very good condition; slight smell of cigarette smoke. The Needlecraft Shop Afghan Collector Series: Scrap Delight, designed by Judy Teague- Treece, Afghan Collectors' Series by The Needlecraft Shop, 1994. Very good condition; slight smell of cigarette smoke. The Needlecraft Shop Afghan Collector Series: Scrap Ripple, designed by Susie Spier Maxfield, Afghan Collectors' Series by The Needlecraft Shop, 1995. Very good condition. The Needlecraft Shop Afghan Collector Series: Simply Diamonds, designed by Robbie Dee Maxfield, Afghan Collectors' Series by The Needlecraft Shop, 1997. Very good condition; slight smell of cigarette smoke. The Needlecraft Shop Afghan Collector Series: Simply Splendid, designed by Carolyn Christmas, Afghan Collectors' Series by The Needlecraft Shop, 1998. Very good condition; slight smell of cigarette smoke. The Needlecraft Shop Afghan Collector Series: Sky & Shadows, designed by Zelda Workman, Afghan Collectors' Series by The Needlecraft Shop, 1999. One-page pattern leaflet. New. The Needlecraft Shop Afghan Collector Series: Snowflakes on Plaid, designed by Susie Spier Maxfield, Afghan Collectors' Series by The Needlecraft Shop, 1997. Very good condition; slight smell of cigarette smoke. The Needlecraft Shop Afghan Collector Series: Solid Gold, designed by Sandra Miller - Maxfield, Afghan Collectors' Series by The Needlecraft Shop, 1995. Very good condition; slight smell of cigarette smoke. The Needlecraft Shop Afghan Collector Series: Southwest Stripes, designed by Denise Cheek, Afghan Collectors' Series by The Needlecraft Shop, 1993. Very good condition; slight smell of cigarette smoke. The Needlecraft Shop Afghan Collector Series: Spanish Beauty, designed by Jocelyn Sass, Afghan Collectors' Series by The Needlecraft Shop, 1995. Very good condition; slight smell of cigarette smoke. The Needlecraft Shop Afghan Collector Series: Spikes of Green, designed by Daisy Watson, Afghan Collectors' Series by The Needlecraft Shop, 1994. One-page pattern leaflet. New. The Needlecraft Shop Afghan Collector Series: Springtime Log Cabin, designed by Trudy Atteberry, Afghan Collectors' Series by The Needlecraft Shop, 1996. Very good condition; slight smell of cigarette smoke. The Needlecraft Shop Afghan Collector Series: Star Dreamer, designed by JoHanna Dzikowski, Afghan Collectors' Series by The Needlecraft Shop, 1996. One-page pattern leaflet. Very good condition; slight smell of cigarette smoke. The Needlecraft Shop Afghan Collector Series: Starflower, designed by Susie Spier Maxfield, Afghan Collectors' Series by The Needlecraft Shop, 1995. One-page pattern leaflet. Very good condition; slight smell of cigarette smoke. The Needlecraft Shop Afghan Collector Series: Strictly White, designed by Roberta Maier, Afghan Collectors' Series by The Needlecraft Shop, 1994. Very good condition; slight smell of cigarette smoke. The Needlecraft Shop Afghan Collector Series: String of Shells, designed by Dorris Brooks, Afghan Collectors' Series by The Needlecraft Shop, 1993. Very good condition; slight smell of cigarette smoke. The Needlecraft Shop Afghan Collector Series: Suddenly Diamonds, designed by Lou Ann Millsaps, Afghan Collectors' Series by The Needlecraft Shop, 1994. Very good condition; slight smell of cigarette smoke. The Needlecraft Shop Afghan Collector Series: Teal Treasure, designed by Barbara Roy, Afghan Collectors' Series by The Needlecraft Shop, 19963. One-page pattern leaflet. Very good condition; may have slight smell of cigarette smoke. The Needlecraft Shop Afghan Collector Series: Textured Treasures, designed by Michele Wilcox, Afghan Collectors' Series by The Needlecraft Shop, 1993. One-page pattern leaflet. Very good condition; may have slight smell of cigarette smoke. The Needlecraft Shop Afghan Collector Series: Tranquil Moments, designed by Trudy Atteberry, Afghan Collectors' Series by The Needlecraft Shop, 1995. One-page pattern leaflet. Very good condition; may have very slight smell of cigarette smoke. The Needlecraft Shop Afghan Collector Series: Treble Rose, designed by Elizabeth A. White, Afghan Collectors' Series by The Needlecraft Shop, 1994. One-page pattern leaflet. Upper corner bent, page slightly age-yellowed. The Needlecraft Shop Afghan Collector Series: Triangles, designed by Katherine Eng, Afghan Collectors' Series by The Needlecraft Shop, 1996. One-page pattern leaflet. Very good condition; may have slight smell of cigarette smoke. The Needlecraft Shop Afghan Collector Series: Tripled & Squared, designed by Jo Ann Maxwell, Afghan Collectors' Series by The Needlecraft Shop, 1994. One-page pattern leaflet. Very good condition; may have slight smell of cigarette smoke. The Needlecraft Shop Afghan Collector Series: Trousseau Lace, designed by Rose Pirrone, Afghan Collectors' Series by The Needlecraft Shop, 1993. Very good condition; slight smell of cigarette smoke. The Needlecraft Shop Afghan Collector Series: Tulip Quilt, designed by Barbara Roy, Afghan Collectors' Series by The Needlecraft Shop, 1995. Very good condition. The Needlecraft Shop Afghan Collector Series: Tweed Granny, designed by Allison Weldon, Afghan Collectors' Series by The Needlecraft Shop, 1999. Very good condition; slight smell of cigarette smoke. The Needlecraft Shop Afghan Collector Series: Victorian Fan, designed by Darla Fanton, Afghan Collectors' Series by The Needlecraft Shop, 1999. One-page pattern leaflet. Excellent condition; may smell of cigarette smoke. The Needlecraft Shop Afghan Collector Series: Victorian Lace, designed by Maggie Weldon, Afghan Collectors' Series by The Needlecraft Shop, 1999. One-page pattern leaflet. New. The Needlecraft Shop Afghan Collector Series: Vintage Cameo, designed by Aline Suplinskis, Afghan Collectors' Series by The Needlecraft Shop, 1994. Very good condition; may have slight smell of cigarette smoke. The Needlecraft Shop Afghan Collector Series: Vintage Memories, designed by Frances Hughes, Afghan Collectors' Series by The Needlecraft Shop, 1994. Very good condition. The Needlecraft Shop Afghan Collector Series: Warm & Toasty, designed by Martha Brooks Stein, Afghan Collectors' Series by The Needlecraft Shop, 1997. One-page pattern leaflet. New. The Needlecraft Shop Afghan Collector Series: Wheels 'n Chains, designed by Maria Nagy, Afghan Collectors' Series by The Needlecraft Shop, 1997. Very good condition; may have slight smell of cigarette smoke. The Needlecraft Shop Afghan Collector Series: Whirligig Blocks, designed by Barbara Roy, Afghan Collectors' Series by The Needlecraft Shop, 1993. Very good condition; may have slight smell of cigarette smoke. The Needlecraft Shop Afghan Collector Series: Wildflowers Scrap, designed by Sandra Miller- Maxfield, Afghan Collectors' Series by The Needlecraft Shop, 1994. Very good condition; slight smell of cigarette smoke. The Needlecraft Shop Afghan Collector Series: Window Garden, designed by Marian Whitman, Afghan Collectors' Series by The Needlecraft Shop, 1993. Excellent condition. The Needlecraft Shop Afghan Collector Series: Winterscape, designed by Zelda Workman, Afghan Collectors' Series by The Needlecraft Shop, 1997. One-page pattern leaflet. New. The Needlecraft Shop Afghan Collector Series: Winter Wonderland, designed by Denise Cheek, Afghan Collectors' Series by The Needlecraft Shop, 1994. Very good condition; slight smell of cigarette smoke. The Needlecraft Shop Afghan Collector Series: Woven Lattice, designed by Shep Shepherd, Afghan Collectors' Series by The Needlecraft Shop, 1993. Excellent condition. The Needlecraft Shop Afghan Collector Series: Yellow Rose of Texas, designed by Rosetta Harshman, Afghan Collectors' Series by The Needlecraft Shop, 1995. Very good condition; may have slight smell of cigarette smoke.